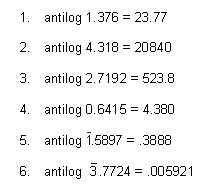 log N = x ⇒ N = antilog x. 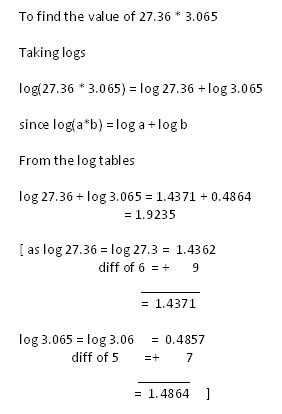 As we have logarithm tables, we also have antilogarithm tables that enable us to find the numbers whose logarithms are known. 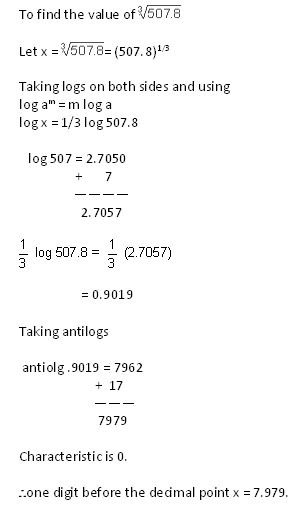 In the first column, the numbers represent the first two digits of the mantissa of the logarithms, the numbers 0,1,2 ..... 9 at the head of the next ten columns denote the third digit in the mantissa. The numbers under the head “Mean Difference” denote the approximate increase in the value because of the fourth significant figure. The number of digits before the decimal point or the number of zeros before the first significant figure of the required number and after the decimal point is fixed with the help of the characteristic. Ignoring the characteristic, we consider only the mantissa. To obtain x, consider the number in the row containing .01 under the head of 9, which is the third significant figure, and increase it by the value given under the head of 5 of the mean difference. The number whose mantissa is .0195 contains 1046 as the first four significant figures. The characteristic is 3 so x contains four digits before the decimal point, or x = 1046. Consider the number in the row containing .10 under the head of 9 the third significant digit and increase it by the number given under 8 of the mean difference for the fourth significant digit. The number whose mantissa is .1098 contains 1287 as the first four significant figures. 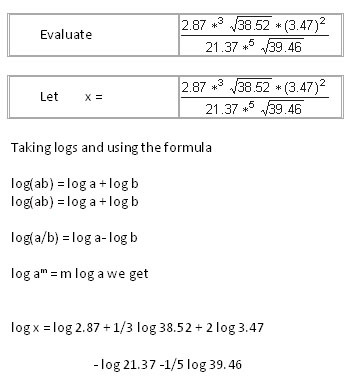 The characteristic of the log is 1. So x contains two digits before the decimal point or x = 12.87. There are four digits in the mantissa. Consider the number in the row containing .09 under the head 6 for the third significant digit and increase it by the number given under 8 of the mean difference for the fourth significant digit. The number whose mantissa is .0968 contains 1249 as the first four significant figures. The characteristic of the log is 4. So x contains three zeros after the decimal point. Since there are more than four decimal places in the mantissa, we round it off to the fourth decimal place. Consider the row containing .10 under the head of 7 for the third significant figure and again under the head of 7 of the mean difference for the fourth significant digit. So, the four significant figures of the required number whose mantissa is .1077 is 1281. The characteristic is 0 so there is one digit before the decimal point, or x = 1.281. 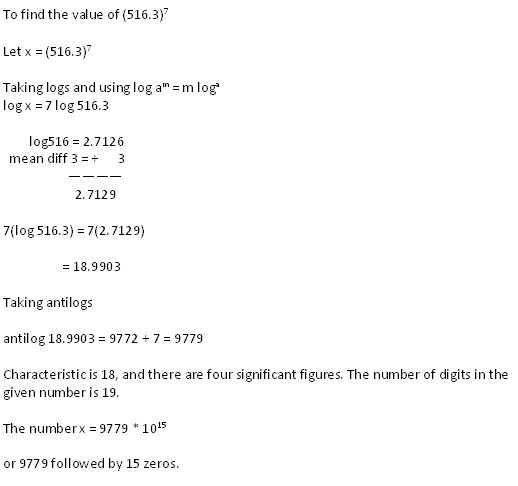 We will now use our knowledge of logarithms and antilogarithms to solve numerical problems. 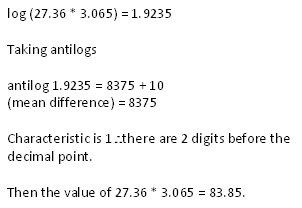 While finding the antilog, take only the mantissa part, which is the decimal part. Never include the digits of the characteristic, which is the digit before the decimal point.